Ariana Grande’s music is a direct effect of her personal life. Her “Sweetener” album, released in August 2018, was her message of hope after disaster and acceptance of new love in her life. However, the turbulence wasn’t over. She lost an old love as well as broke off her engagement by the end of the year. “Sweetener” acted as Grande’s response and return from a mournful time, so it’s no surprise her recently released album, “thank u, next,” follows suit. Grande teased three singles off her album for months, dangling the release dates of “thank u, next,” “imagine” and “7 rings” over fans’ heads. After the release of the album every girl, gay and their grandma was quoting the song’s chorus. Everyone but me, anyway. I’m way too bitter to thank any of my exes. The second single released was “imagine,” a moody and mournful track reminiscent of what could have been. Fans gushed over Grande’s use of whistle notes — the talent that arguably got her recognized in the beginning. The two hate being compared, but when Mariah Carey hits the whistle notes, they’re the sprinkles on top, not the sundae itself. “Thank u, next” was catchy enough to be memorable and authentic enough to not be annoying. 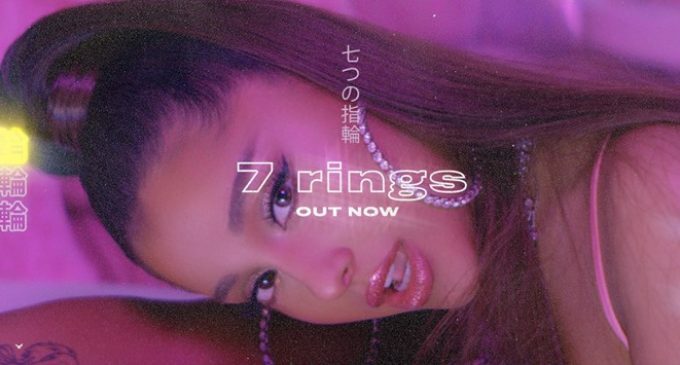 However, the same could not be said about “7 rings.” Past the plagiarism accusations, the song’s bouncing beat and icy tones felt typical and uninspired. Fans thought Grande’s growth and change of attitude after her turbulent relationship with comedian Pete Davidson meant a reinvention of the artist’s sound. Instead, the anticipation was met with a rehashing of familiar, worn-out beats and Grande trying to fit in with hip-hop trends. Thankfully, Grande’s full-length album is not a representation of any of her single releases. What “thank u, next,” “imagine” and “7 rings” lack in complex thought and originality, songs like “needy,” “bad idea” and “ghostin” make up in authenticity and vulnerability. “Thank u, next” explores an arrangement of thought and self-evaluation after a breakup, from remorse to spite and the hardening of the heart to desire and loneliness. What makes a great song? Some might say metaphorical lyrics, transcendent beats or complex arrangements, but a truly great song should shake you to your core on the very first listen. “Ghostin” is that song. Grande executes heavenly sounds well and “ghostin” is the beam of angels’ rays that shine through parted storm clouds. But it’s not life we celebrate, it’s the death of a relationship desperately held on to and the following guilt and regret. The song’s dreamy synth-and-strings melody is paired well with a celestial choir backing up Grande’s sorrowful vocals. Throughout the album, Grande reveals she is indeed human and not a supernatural being void of emotion and pain. Grande tragically reveals that her mourning of the late Mac Miller had a direct effect on her relationship with Davidson. In “in my head,” Grande is confronted with a hard-to-swallow revelation and comes to terms with a lover not being who she thought he was. “NASA” captures Grande’s need for space. According to the official album description, “thank u, next” was meant to end with a sentimental track titled, “Remember.” Instead, Grande decided last minute to replace the track with the juvenile “break up with your girlfriend, i’m bored.” Supposedly, Grande isn’t ready to grow up yet, which I guess is appropriate because that’s exactly the type of song to represent being back on your BS. Grande has yet to make an iconic album, but “thank u, next” was definitely a step in the right direction.